Our Web Design & Development service creates an affordable, dynamic and custom-made visual identity of your products/services, guaranteed to optimize your online presence worldwide. Brainstorming: Before launching a project, our team leaders will brainstorm with you to focus on and determine what the key objectives of your site are. Remember, your priorities are our priorities! Assimilation: Together, we use this time to gather and assimilate information about your business and products/services offered according to your current marketing strategy as well as your future ambitions. Cost and time: This first phase also allows us an accurate assessment of cost and time needed to create your website. Roadmap: Having reached a negotiable agreement with the creation/revamping of your website, we release a ‘roadmap’ which will be followed during the entire construction/revamping process. 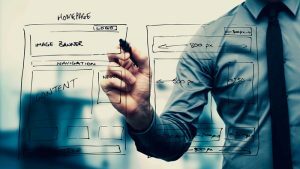 Design: After determining what the best possible website style and structure is, based on your goals and marketing activities, we will optimise a simple and clear navigation so that your visitors enjoy the full experience of your website, and dedicate great importance to optimise your site for SEO purposes. Consultation: Here, we offer you our professional advice on the best web techniques to improve your website, top search engine results, attract new clients, retain existing ones, and much more. Our consultation will save you time and money, and help you generate more revenue for your business. To find out more on how you can benefit from our Web Design & Development expertise, contact us today!